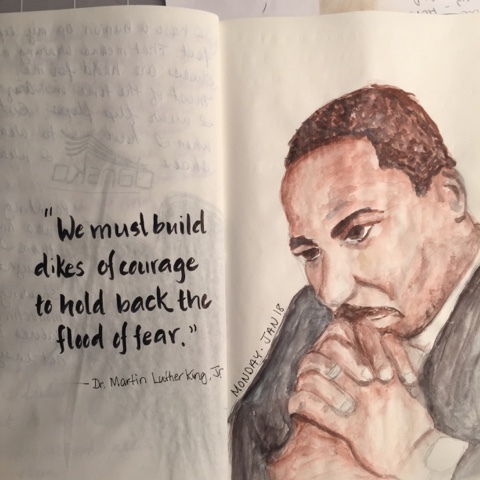 I have used quotes by Dr. Martin King Jr. in my art before, but I had never seen this one before. It seems so fitting today, with fear driving some of the presidential campaigns today. Fear certainly is a powerful motivator. Kids certain know it, and people who abuse power knows it too. And though I think a little fear is good to get you motivated to do the right thing, it shouldn't be the primary motivation. People in the position of power, whether you're a parent or a leader of a group or country who use fear to "control" others cannot sustain loyalty or command respect. People will follow only until the threat of fear is gone. So the leaders create more fear, more lies to sustain their power. And who will help us build our dikes of courage? Yesterday was Tikkun Olam day at our synagogue. Tikkun Olam roughly translates to repair the world. It is a day for our congregational community to get together to give back to our community at large, do some charity work. 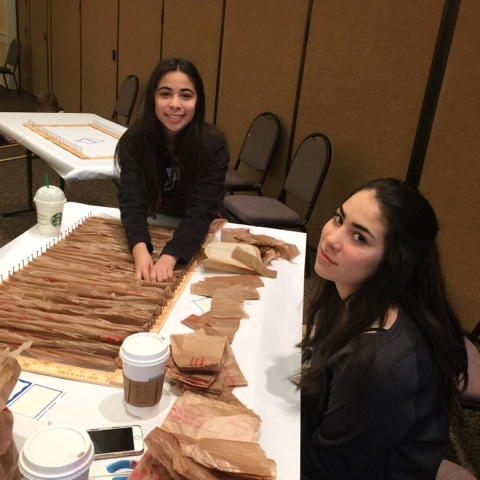 Girls and I particles in making mats for the homeless out of plastic grocery bags. This is not a quick job. 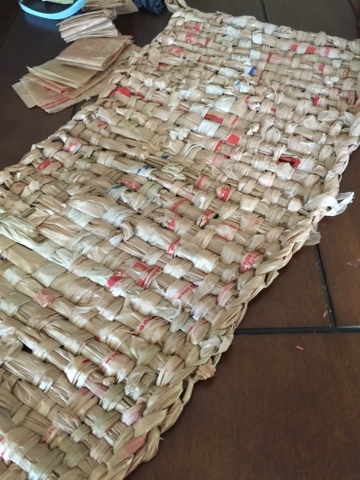 It took us two hours to make one panel and it takes 4 panels to make a mat! We brought home two looms so the girls can continue to make them throughout the year. And I'm going to crochet a mat whenever I can. I just have to do the prep work of creating strips of plastic and making a ball of "yarn." I feel like we have a lot to be thankful for. Even with all that happened last year, we never worried about not having a place to live or be hungry. I think this is something our family can do.. So for today's art, I sketched MLK using only two colors, pyrrole scarlet and phthalo blue. It's amazing what two colors can create! 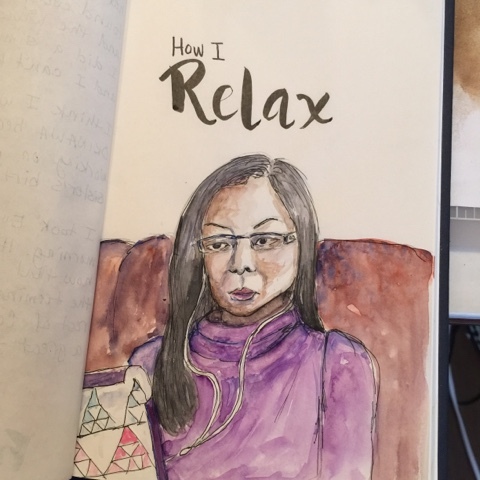 And over the weekend, my prompt for Saturday was "how I relax" and for Sunday it was "favorite shoes." So here they are.. I often read and listen to music on my phone. I have my phone with me all the time and I love to read. It just makes sense. 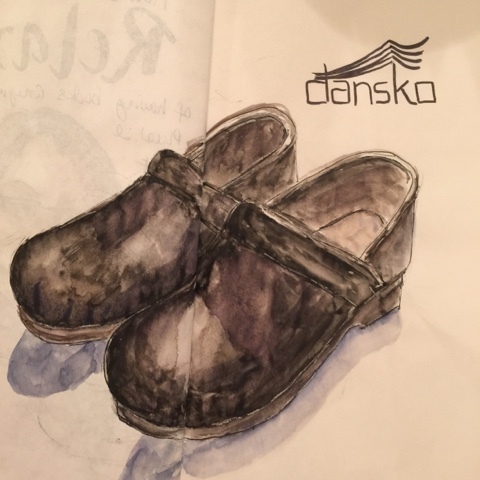 Other than flip flops, I love my Dansko clogs. These are shoes that many nurses and doctors wear because they are so comfortable. They aren't the prettiest pair of shoes but they are definitely comfortable! My girls and I are going to watch MLK's "I have a dream" speech on YouTube. It's our MLK day tradition. And maybe work on the mats. I love all the activities do with your kids- how they set such great foundations.